I make my morning coffee without incident. As I take the first sip, I remember that I am supposed to take my morning medications before I consume anything else. I dump the Friday contents of my meds box on the kitchen counter and take down the Costco size container of fiber powder for the first of my gawdafwul 3-times daily dose. I scoop the spoon high with my colonic corrective and—somehow missing the glass of water—dump the fake-orange-flavored devil’s dust on the foam that tops my homemade caffé latte. Doña Quixote: Go directly to jail. Do not pass GO. Do not collect $200. My anxiety level shoots up completely beyond what the occasion merits. Peter makes me new coffee. “When you’re up and dressed, let’s go to the mall,” my living-in saint says. “Walking around a bit will settle your nerves.” I give him a hug, in the process nearly dousing him with my fresh-from-the-kettle beverage. I flee to the back garden, slamming the door in D. Q.’s face as I exit. Alone I watch the squirrels and birds feed. When I go back inside, Doña Quixote is lying in wait in the bathroom. Doña Quixote: A knight must not complain of her wounds though her bowels be dropping out. I am, in fact, just using the toilet. Must remember to flush. Peter has been noticing that I often forget. When I’m done, I flush. No water comes out. Has the city turned off the water? I shout for Peter. But wait: the toilet bowl is clean. I realize I must already have flushed it. My brain gets the message too late and my hand flies out and flushes again. FOR THE SECOND TIME, I WORRY: WHY IS THERE NO WATER? I figure it out–again–hit myself on the head. I take my bath as fast as I can, go downstairs to get dressed. I look for the long yellow tank top that I wear under my blue shirt so it hangs out from underneath. It is nowhere to be found. Our house is very small and there are not very many places to look for a lost clothing item. I look again, mushing my hands together as if squeezing a stress ball. Doña Quixote: When life hands out lemons, squeeze out a smile. Don’t get me going about the positive psychology movement that sells the kool-aid that an upbeat attitude is the cure to all sorts of maladies. What will cure what’s wrong with me is finding my yellow tank top. So I grumpily start round two of my search. I am a tidy person, and getting obsessively more so as the rest of my world turns to chaos. Lately, however, I can’t even find something even if it is in its right place. I seem not to register it even if it is right in front of my eyes. Whatever the reason, no yellow top emerges. I call in my resident saint. Together we check all the possible spots. No success. I am percolating with anxiety. I shake some of the stress out of my hands, say my mantra, “I can only do what I can do.” I pull myself together, I pick another outfit with the same formula: my Madonna tank top with the purple shirt over it. At the mall, half-an-hour of walking on my own somewhat calms me down. It is very important to me to retain this vestige of independence: walking where the spirit takes me inside a mall, where I cannot get too lost. I touch the clothing textures, smell the candles and soaps, listen in on neighboring conversations. I see a tee shirt I like, try it on. Not my style after all. One or two stores later, an employee comes up to me and says, “Ma’m, I hope you don’t mind, but I think you’d want to know that you are wearing your shirt inside out.” I thank her profusely, go to the change room, turn the purple shirt the right side out, then check the mirror to make sure the pretty vintage buttons I ordered from Amazon are visible this time. Taking off at a speed-walking pace, I just walk and walk until I’m out of breath. I notice it’s time to meet Peter for coffee. Damn! Where did we say we were going to meet? Panic suffuses me. I cannot figure out what part of the mall I am in. I reach for my phone. It’s not in its usual pocket! I remember that I plugged it in to charge it—was it yesterday? The day before? I walk around in a daze, looking out for Peter. Gradually, like a polaroid coming into focus, it occurs to me that my phone might be somewhere else in my handbag. I sit down, check the other zippers. Before I have completed my search, my phone rings—in the pocket it is supposed to be in. How could I have missed it? Before I can answer it, I remember: The coffee shop! I abandon the attempt to answer my phone, because at the time I think I have to type in my privacy code for my phone to pick up and I feel too confused to do it. Instead, I head for the coffee shop with as brisk a trod as my fifteen-years-ago-crushed-ankle-that-is-plagued-with-rheumatism allows. Peter is relieved to see me. I hold tight onto his arm as we order coffee. Like the woman in the Bible who drew healing energy from Jesus by touching his cloak, I recharge myself from the warmth of his body. While we drink our coffee, Peter helps me reconstruct the bad events of the morning and I make a note on the back of a receipt. A sort of instant journal entry. I don’t believe in positive psychology, but I do believe in Freud’s “talking cure.” Peter kindly takes the role of the Father of Psychoanalysis. Despite my long list of failures, it is only about noon. Instead of continuing our walking, we decide to go back home where a long list of to-dos await me. On this day, I don’t even look at my plan-for-the-day notes. It doesn’t even occur to me to look at them. All I can manage is to stumble downstairs to have a nap. I nap until dinner time. I have stress dreams, in one of which I am in a play of sorts. I am in a dressing room with a group of young women in sparkly leotards, but I am dressed in a Shakespearian queen’s cloak of heavy red velvet, complete with a hood. My whole body resists being in the play, but I am swept up in the activities and can’t get out. A sense of loyalty also prevents me from abandoning my role—whatever it is. I’m worried that I don’t know what I’m supposed to do and have not been given the lines I will be required to speak. We go onto the stage and I stand on the one side for a long time, trying to figure where I’m supposed to go. The audience looks at me. A sense of extreme awkwardness pervades the whole theatre. I have to make a decision, so I slowly walk toward the young women who by now seem to be in a boat such as those used on the Thames when the universities race against each other. I walk to the boat majestically, as if my hesitation and slowness are part of the play. I wake up a bit, turn on my side, plunge directly into a similar stressful situation. After dinner, I consult my to-do list. It makes me sick just to look at it. I go to bed early. And so it continuous. Saturday becomes a series of naps plagued with dreams. In between are half-hearted attempts to do a task—any task: Get dressed. Read. Check my e-mail. But I’m too depleted. I can’t even bring myself to go downstairs. I have a nap on my side of our La-Z-Boy two-seater couch. Doña Quixote: Abandon all hope ye who enter here. On Sunday I am better. I ask Peter to take a photo of me. 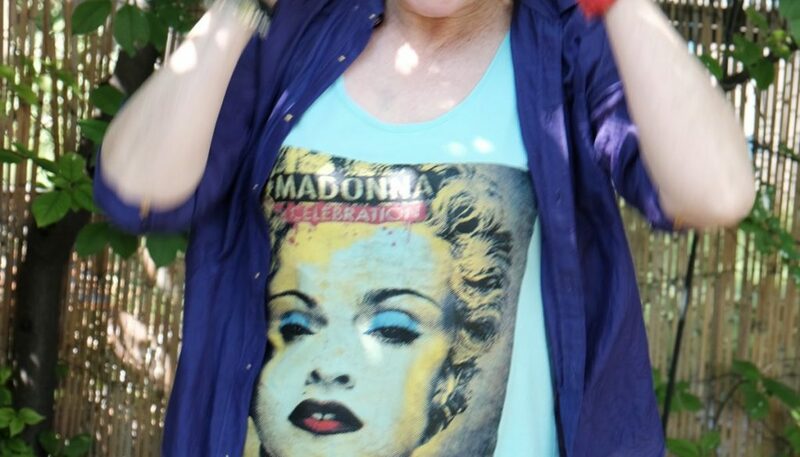 I dress in my Madonna tank top and purple shirt. I put the shirt on inside out. I stand where the light is right for my resident photographer, try to look pissed off. In some shots I manage, in others I burst into a grin at my and Peter’s silliness. It’s clear that dementia is nibbling away my inhibitions—I never before could bring myself to stage my own theatre of the absurd like this, even in my own back yard. Peter is laughing, glad to have me back. Doña Quixote: Next time won’t you sing with me? Ahh Gerda this post was so sad for me to read. Dearest Jeannine, I appreciate the many-symboled love from you. Lots of love to you and your family. Dear Charmaine, Thanks so much for your note. I really appreciate hearing that my writing gives people insight who are dealing with dementia in your own families. I am sorry to hear that your mother has Alzheimer’s. I am very glad to hear that she has such a caring daughter in you. Thanks so much for your empathy. I think, though, that empathy should go to the caregivers more than to the people who have the disease. However annoying I am to myself, I think that I must be more upsetting to people who used to know me as someone who could cope with anything. Thanks so much for the work and love you give to your mother. I only know you now because of your friend Erna’s sharing your blog. Gerda, I am so deeply humanly moved by your sharing your experience. Maybe this is the greatest work of your life. And while you are working on surrender and serenity, I hope there are people working frantically on finding cures. Strength and love to you and Peter both. Dear Tsivia, thanks so much for your kind words–your insight that sharing might be “the greatest work of my life” is very valuable to me. I very much appreciate your good wishes to me and Peter. (Sorry it took me so long to get back to you–Peter and I had a lovely week in Las Vegas. Being in a hotel and not having any household responsibilities –the few things that i still do–makes my daily life so much easier. It’s great to know that Erna is the reason for our connection–and thanks so much to you for reaching out. I send you and those you love armfuls of love. I have very nasty words for Doña Quixote but I suspect she is an allusive fickle unpredictable creature and wouldn’t hear them. Thanks so much for your lovely condemnation of Doña Quixote–she’s a pain! I left her in Salt Lake City last week–Peter and i spent time in Las Vegas–not that it’s my favorite destination, but it’s close enough to get to (and we got a free hotel room) and given the walkways that criss-cross over the strip, I can walk long distances by myself without taking my life in my hands by crossing a busy street! Because I was away, I only got the news about your grandchild when we got back Friday. I am so happy for you. I will gush more on Facebook and/or your blog! Becoming an ouma has been one of my most wonderful experiences–so glad I’m older and wiser around “those fresh from God” (as Charles Dickens says) this time around! And most of the time I try not to give unsolicited advice to my kids–very hard for someone with a mouth the size of mine!